The L&G team of skilled engineers have recently refurbished a hot liquor tank for respected Norfolk brewery, Woodforde’s. With over 30 years experience in the brewing industry, Woodforde’s are passionate about their fine quality beers, produced using Norfolk barley. A hot liquor tank is used to supply the hot water used in the brewing process, which needs to be kept at specific temperatures. As Woodforde’s pride themselves on their premium product, it’s important that their equipment is installed and maintained to a very high standard. 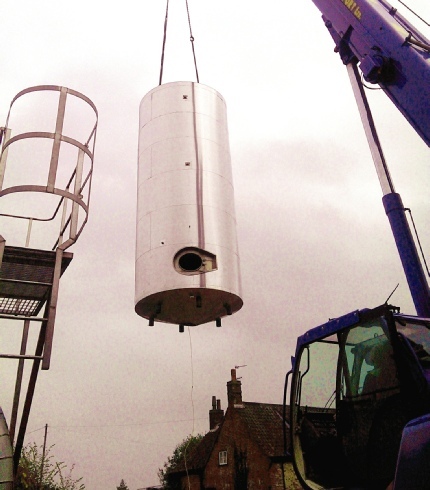 L&G are pleased to provide and install such specific, high quality brewing equipment to this local firm. In addition to supplying and fitting specialised equipment to the brewing industry, the L&G team work on projects for the food processing industry and are fully competent (and registered) in commercial gas fitting. The team at L and G Engineering have recently finished fabricating an important piece of fire suppression equipment for fellow Rackheath firm, Delta Fire. This prestigious company supply fire safety and suppression equipment to the Defence, Marine, Aviation, Industrial, Petrochemical and Fire & Rescue sectors, with a reputation for reliability. 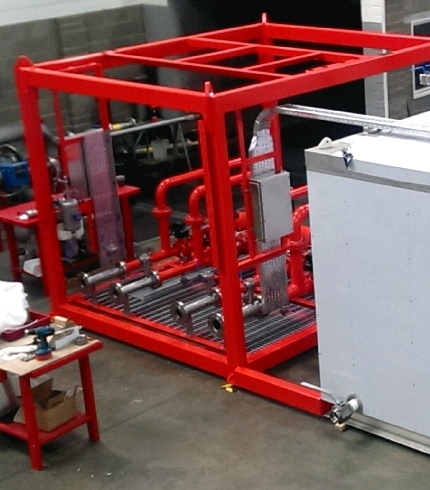 Work included the construction of the skid tank (full unit), and associated pipework and fittings, resulting in a high standard fire suppression system for a methanol storage installation, where safety is of paramount importance. The stainless steel structure is representative of the skilled workmanship that we pride ourselves on here at L&G. At L&G we fabricate a selection of specialised equipment, not just for the fire safety sector, but also for the food processing and brewing industries, in addition to offering commercial gas fitting services and bespoke steel constructions. At L & G Engineering we don't do things by half, as you can see by one of our latest projects, the design, manufacture, testing and installation of a large circular spray booth for Permastore. Permastore is the leading manufacturer of Glass-Fused-to-Steel tanks and silos, supplying clients across the world. Its busy facility in Eye, Suffolk provides structures to municipal, industrial and agricultural markets, which are used in water processing, sewage treatment, bulk storage etc. 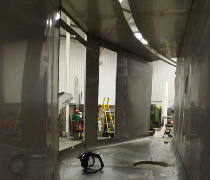 The large circular spray booth created by L & G in conjunction with Electromech control gear technology, will enable Permastore to effectively spray enamel on large, curved metal sections for use in their tank production. We always enjoy new design and manufacturing challenges, so if your company is looking for a new innovation, give us a call! 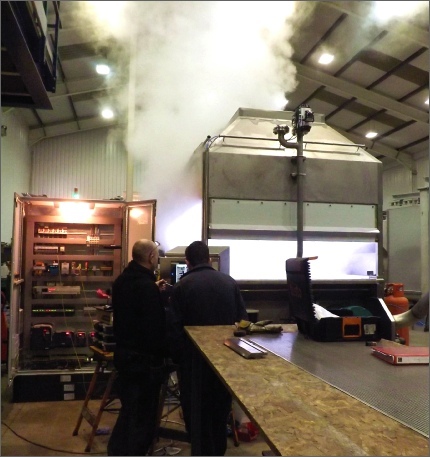 At L & G Engineering, we've been busy working on a bespoke fryer for prestigious clients in mainland Europe. 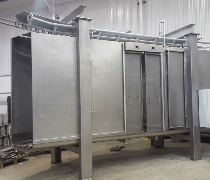 Our skilled team has worked hard on this project, with final tests carried out this week, ensuring that the fryer is ready for shipping to our clients. At L & G we pride ourselves on our skilled team who work hard to produce high quality, bespoke manufacturing services to meet specific client requirements. 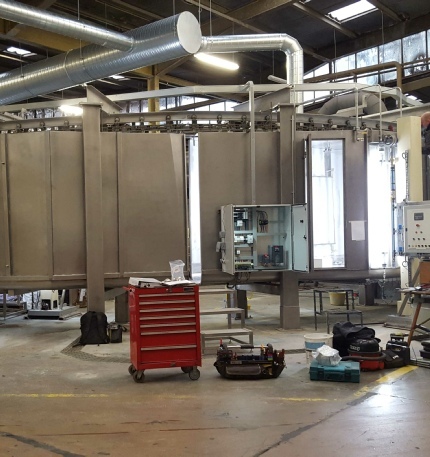 Our wide range of services includes fabrication of bespoke Gas Fired Batch Fryers, Ovens, Dryers, PLC Control systems and a comprehensive selection of finely engineered Thermally efficient equipment for the Food industry.